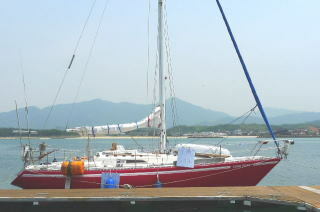 FishArena, which is a Japanese English, is a small marina in a fishing port. 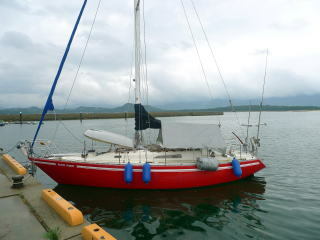 While the fishing port is basically for commercial fishing boats, FishArena is open for pressure boats such as yachts. It is managed by a local Gyokyo, i.e. Fisheries Cooperative Association, or a joint public-private venture. The management entity of Murotsu FishArena has been changed because of lack of money though, it seems to be alive as a small marina. The sailing boats yearly contracted with the FishArena were moved one by one from the seaside pontoon to the landside pontoon. The broken seaside pontoon would be fixed and reopened. I moored my boat bow-to at the fee-charging quay as I did last time. At Murotsu, you can’t go any place without bus services. - Mare Toyoura, which is a big super market. - Kawatana (railway) Station, which is close to Maruwa supermarket. Check Blue Line’s timetable of unfrequented bus services. The management entity of FishArena has been changed. 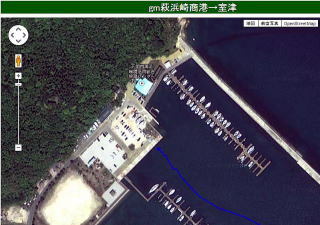 The pontoons are now managed by local Gyokyo. A half of the seaside pontoon is now broken and useless. About twenty boats are still moored. Visitor boats can be moored between those boats. But, as many docking lines are tangled, be careful. At first, I moored my boat at the half-broken pontoon. But, as it is dangerous, a marina guy advised me to move to a quay. Then, I moored the boat bow-to at the clean quay. They charge you at the pontoon and at the quay. The pontoon fee is higher than the quay fee, because water and power are available at the pontoon. There is a toilet at a park. A restaurant in front of the pontoon has toilet either. No coin laundry around. I saw a signage of coin laundry at the opposite side of Mare Toyoura though, I didn’t confirm it. Provisions: There is only one small shop around. Maruwa is a big supermarket located near Kawatana (railway) Station. No big shop in Kawatana Onsen. Mare Toyoura is another bigger supermarket on the way to Kawatana Station. Juntendo is a do-it-yourself shop next to Mare Toyoura. You may buy fuel of a carrying fuel tank volume at nearby maintenance company Aoki. Kawatana Onsen is 30 minutes bus ride away. It is difficult to go there by bicycle. Water is available at the pontoon or, if you moor at the quay, at a park. Because of hidden rocks, you distance from the shore. Once you arrive off the FishArena, to keep off fishing nets on your right and in the back of bay, you move to the east (to your left) enough. Then change your course to the west southwest, you head to the left end of a breakwater which runs from the west on your right. 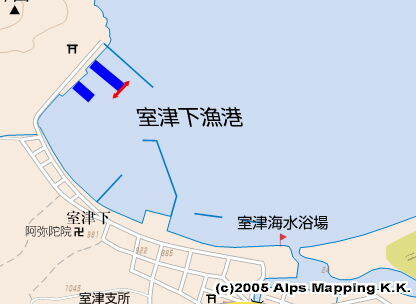 While there is no lighthouse, there is a red pole at the east (left) end of the breakwater. You will see masts behind the breakwater. Once you pass by the breakwater, you will have a full view of the FishArena.